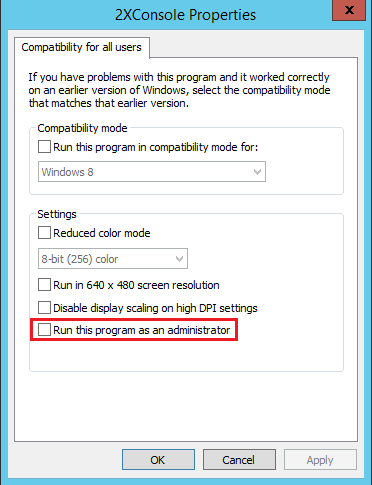 How to make published application run "as an administrator" by default. Navigate to the server from which the application is published. Navigate to the folder where the application is installed. Right-click the application .exe file and access Properties. Click "Change settings for all users" button. 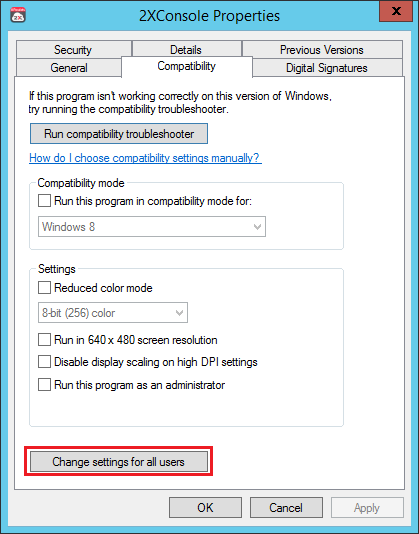 Flag the "Run this program as an administrator" checkpoint and apply changes. Note: From now on this particular published instance will be launched with administrative rights for all users that will have enough permissions to launch it. Application started through Parallels 2X RDP Client will trigger Windows User Account Control so users should confirm that they have administrative permissions.